The biggest irony in this Saturday Night Live sketch from last night featuring Eli Manning is the idea of him working this closely with Madden NFL on anything. Widely believed to be too expensive even for EA Sports, if the two-time Super Bowl champion, or his brother, had any intention of making a signature appearance in the game or on its cover, both would have done so long ago. Cavorting in ping-pong ball suits is verging on comedy cliché, but Manning saves it at the end with the bit about the grenade. 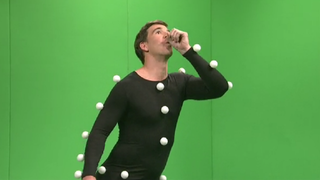 The funniest parts are the impersonations of other NFL stars by the SNL players, though. It's not Joe Montana telling Jan Hooks and Phil Hartman he'll be in his room masturbating, but it'll do. The clip is embedded below. Yes, it's Hulu. Yes, that means you can't watch it if you're not in 'Murica. Sorry.